Great book, great condition, wonderful price and timely delivery, Great JOB Amazon.com. Keep up the good work. I read this in an afternoon; I just consumed it.I sure wish this had been a textbook while I was in college!Honestly it made me feel I'd lost time, and what was I waiting for? 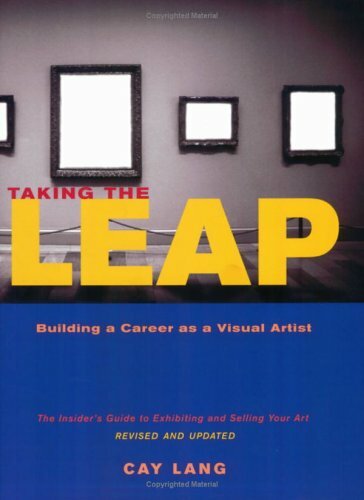 This book was really for the beginner whom wants a career as an artist. This is a great book for a beginner. There was very little new information for me which was disappointing. That said it was motivational, and provided information about taxes for the artist and consignment forms which was in fact information that I knew very little about. It was a quick read so if you have access to a copy then you might as well read it but be forewarned, there was no information on grants which was my motivation for purchasing the book. Sorry Cay! The Creative Entrepreneur is a visual, results-oriented, step-by-step method of business development for creatives from all walks of life who want to turn their passions into viable business opportunities. Whether you are and artist, designer, or small business owner, this book will empower you to renew and nurture your vision with the steps required to take an idea and make it real. The Creative Entrepreneur offers a dynamic left brain/right brain approach to developing a business focus that evaluates underlying internal issues unique to creative types and shows how to practically address them. I've only just started working with this book but it definitely speaks to me. Though I'm a writer, the visuals inspire me in a way writing isn't these days - it's getting me to think outside the proverbial box. From the description: results-oriented, step-by-step, development, viable business opportunities, empower, vision, dynamic left brain/right brain approach, developing, business focus, evaluates underlying internal issues, business and strategic planning tools, and creative business journey. Those aren't words of an artist, they're the regurgitated words of a thoughtless executive.I don't want to buy this book now, I want to throw up. This rocks! I'm a creative minded soul and Lisa's book completely demystified how to start a business in a smart, well thought-out manner. Using her mandala model, I discovered assets I wasn't even aware of. I clarified a positioning statement that ignites me.And going through the journaling prompts, I'm now conscious of my own constructive and destructive tendencies. Right now I'm creating a strategic plan for my year ahead. I'm thrilled I have this book to guide me as my new business comes to fruition! 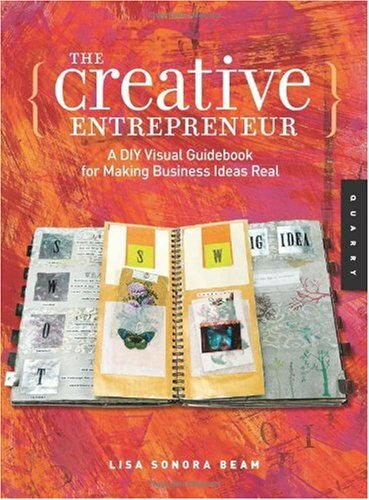 This is an unique book where the author presents the visual journaling techniques and prompts to meet the three basic challenges faced by many creative/visual-oriented entrepreneurs: dealing with the emotional & psychological mental blocks, misunderstanding the creative process, and lacking the practical business knowledge. The first three chapters of this book focus on the self-analysis, discovery of skills and talents, and mental/psychological blocks. The last two chapters provide the strategic tools for managing and growing your business. The author show how a visual journal can be used as a living document that is subject to change over time, and also is adaptable to ever changing personal needs and business climate. The first chapter, the shortest one in the whole book, shows how various journaling techniques can be used for brainstorming, problem solving and gaining insights. Additionally, it lists the benefits of a visual journal, and also briefly mentions what supplies (simple) are needed to create one. Chapter two starts with the creation of a flower with four intersecting ovals that can be viewed as the creative entrepreneur's mandala. This enables one to see a"big picture" of the essentials needed for the realization of one's business vision. Chapter three, the largest of all, views the blocks not as personal barriers but opportunities for growth. It explains the characteristics of each side of the brain (left & right), and how they can work together rather than compete. It also shows that it is necessary to understand the four modes of functioning so that they can be controlled and managed more effectively. Both the constructive and destructive aspects are identified for each of the mode, and the remedies are provided for each of the destructive ones. The fourth chapter shows how one can think strategically like a CEO using the managerial planning tools provided in the book. The basics of promotion and marketing (branding, packaging, advertising and media selection) are presented in the last chapter which utilizes the strategic approach rather than the tactical one. At the end of this book is a DIY project: a mini journal that allows one to document the strategic plans, to keep track of one's progress, and to recycle the existing paper cards and ephemera instead of buying expensive business planning books. I have submitted several pages from my own journal for the inclusion in this book; however, I did not get the whole manuscript when I did some of the exercises. Consequently, I did not get a chance to develop the strategic plans for bringing my business ideas to fruition before I got this book. Pretty soon, I will have to go back to my visual journal pages for refinement and reassessment. But I can rely on this book to help me develop my own strategic plan with its visual journaling techniques and prompts. Internationally recognized artist and author Robin Hopper details survival strategies for developing a personal lifestyle as a creative artist. The text is a combinination of pragmatism, practicality, and philosopy, liberally spiced with humor and anecdotes from Hopper's 45 years of personal experience. The book also incorporates personal life stories of 19 full-time studio artists. Between them, these artists have more than 500 years of studio experience in the art of staying alive. As with all of Mr. Hopper's other books it is complete. He is articulate and detailed providing the reader and user tools to navigate their world in both business and art. I didn't start out thinking that pottery was ever going to be "my thing".After serving in the military then working in "the real world" for a few years afterward, I had every intention of an Ivory Tower life.I was going to university and never leaving!I went to school with the goals of earning my BA/MA/PhD, then spending the rest of my life doing research and lecturing.Just six years later, I left due to the escalation of disabilities I acquired in service. And then one day, I was put into Occupational Therapy and discovered my Zen -- playing with mud.As scary as the idea was, it kept creeping into my mind more and more often as each new month passed by: I had started contemplating whether or not I could make a go of it as a potter. I hadn't had any formal training in pottery or ceramics, so I starting devouring articles and videos, borrowing books, and subscribing to pottery email discussion lists ... and this one book title kept on being thrown around any time the topic of making an actual "living" from pottery arose: Stayin' Alive. *What in the world am I getting myself into? *Should this just stay a sublimely mind-clearing hobby or will I be able to handle the business side of things too? *How much [time/effort/money] will I really have to invest to make a decent go of this? *Am I too old to start on this particular ground floor? *I know I'm CAPABLE of throwing on a wheel, but will the rest of the business be too demanding for my disabilities? I now know exactly why so very many potters heartily recommend this book.There is a variety of insight to be gained from various authors, and Hopper includes some very pragmatic information about the business end of things.It really helped settle a lot of questions for me.I'm still pacing myself, taking things slowly, but now I have a much clearer idea of where I want to take my mud habit and how to make that happen.